Sigma Interview: "Shifting our brand to a more premium range was definitely a good move"
To many people, Sigma used to be brand that offered affordable alternatives to their camera manufacturer's lenses and some quirky cameras alongside, but a few years ago things started to change. The company acquired sensor manufacturer Foveon in 2008, before it overhauled the design of its lenses and began to focus more on wide-aperture, fixed-focal-length options. The most recent of these have been lauded for their performance among reviewers and users alike, and it's fair to say that many now view the company quite differently to how they used to. We caught up with Paul Reynolds from Sigma Imaging UK to find out more about the company's successes, as well as the need to adapt to changes in the market and the future of Foveon technology. 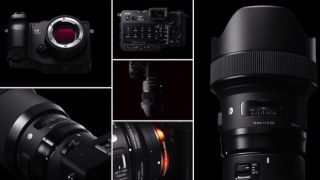 Sigma has traditionally offered more affordable alternatives to more mainstream lenses, but some of the company’s most recent lenses have been favourably compared to some of the most expensive options around. Has a shift towards more premium products been a conscious one? Most definitely. We introduced our Global Vision range of lenses in 2012, organising this new range into three categories; Art, Contemporary and Sports. The whole range, and Art lenses specifically, have been very well received. The photography market has shifted and the more consumer end of the market has shrunk significantly in a relatively short period of time. Shifting our brand to a more premium range was definitely a good move. You now offer lenses for a range of mirrorless mounts. How big a sector is mirrorless for Sigma? We currently produce four prime lenses dedicated to mirrorless cameras, and also an MC-11 Mount Converter which allows Sigma SA and EOS mount Global Vision lenses to be used on Sony E-mount cameras. Mirrorless camera sales are certainly on the up and they have many advantages over SLRs. However, whilst mirrorless cameras are popular, worldwide lens sales for mirrorless cameras are not increasing at the same rate. It seems many users stick to the kit lens or buy just one additional lens, which is different to the SLR market. Of course, we are monitoring this carefully and expect it to grow over time. Are there any particular lenses that are frequently requested but either too impractical or expensive to manufacture? I remember someone once asking for a 14-600mm F2.8 lens. I’ve still not seen that one come through! Generally speaking, the frequent requests are for lenses which are reasonably practical, however people sometimes ask for ultra-fast zooms, like a 24-105mm F1.4, not realising that they might struggle to even lift it – let alone afford it. Are there any gaps in the range that you are keen to fill? The Sigma Corporation is always looking at areas where we can improve or add options for photographers. Often this isn’t about creating new focal lengths but revisiting traditional ones and improving them. In 2012 we introduced the 35mm F1.4 DG HSM Art lens which is regarded as one of the finest lenses available today. At the time, prime lenses were not particularly popular but with this introduction, and the launch of subsequent Sigma F1.4 prime lenses, it seem to have reignited the use prime lenses again with photographers wanting the benefits that they offer, such as very shallow depth of field and smooth bokeh. Is it harder to manufacture lenses that can do sensors with a high number of megapixels justice? Do you have to employ higher-quality materials or use different processes? That’s a good question. The short answer is yes. Many people don’t realise that the resolving power of the lens has to match or surpass that of the image sensor in order to get the best from it. Our Art, Contemporary and Sports lenses use the highest quality glass available and are capable of resolving 50MP+ sensor resolution. In fact, all Sigma lenses now leaving our Aizu factory are optically tested before despatch on an MTF tester, which we had to build ourselves as no commercially available MTF machine offered the resolution high enough to test our lenses sufficiently. Many of Sigma's lenses end up being used on bodies from other manufacturers. Is it challenging to keep up with changes in their technologies? As camera technology changes, so do the protocols and electronics inside them. Generally speaking, there are very few issues with this but one of the benefits of the latest Sigma lenses is that they can be updated with new firmware by the user using the Sigma USB Dock, which essentially makes the lenses future-proof. The USB dock has been particularly well received by photographers. Are there any plans to evolve this in any way? I remember years ago joking with a colleague about the idea of having lenses with a USB port so we could plug them into a PC. The USB Dock is essentially just that. Like all innovative products, sales started slowly but as more people understand how useful they are sales have skyrocketed. In terms of evolution, we have now developed a USB Dock for our latest flashgun, the EF-630 allowing firmware updates to be processed quickly and easily. How have photographers responded to the most recent sd Quattro cameras? Do you see any room for improvement for the next generation of Foveon-equipped cameras? The Foveon equipped cameras produce detail which is easily comparable to medium format cameras. In terms of operation, it’s not too dissimilar to using a medium format camera either, suited best to studio or landscape photography perhaps. The latest Sigma camera, the sd Quattro H, uses a physically larger image sensor to the others in the range and has caught the attention of many working pros in the industry. What’s the future for Foveon technology? The fundamental principle of capturing light using three layers is obviously proven – it’s exactly how colour film works. Over the years, the technology has improved and nobody can argue with the quality of results in the right conditions. We have a small but strong team at Foveon and the system is always being improved bit by bit. Do you think it will ever be possible to record video with a Foveon sensor? I hope so because the detail will be incredible! As the Foveon sensor captures three times as much data as Bayer sensors, the processing does tend to take a little longer. This is fine for stills work but for video capture, there is obviously a vast amount of data which needs to be processed very quickly. As technology improves, processing will speed up – so watch this space.